Why permanently connect your PC to your CNC machine when you can use our NEW Pendant CNC Controller? The MO-CON501 CNC Pendant Controller with built-in DSP (digital signal processor) reads G-code or PLT programs (text file) from a USB memory stick or its internal memory. The controller then converts it into an output signal to the motor drives. It also provides digital outputs to control a spindle motor (up to 16 speeds). The MO-CON501 also accepts inputs from up to 3 limit switches and can supply power to 3 proximity sensors. It also has an input to allow automatic setting of the Z-axis (after tool changes). 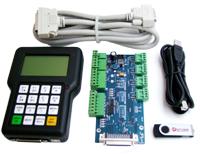 * Easy problem solving due to "On screen help function"
All manuals, wiring diagrams, videos, and windows transfer software for the MO-CON501 CNC Pendant Controller Kit are supplied on the Memory Stick. Online technical support and remote desktop assistance are available. Please contact us for more details.